Few people have survived on a tiny tropical island by eating muesli, but I am one such person. To make a long story short, there was a dreadful “resort” that featured two breakfast items: leaden German pancakes and muesli. Lunch was not served at all, and with no stores on the island, I would down 3 bowls of muesli every morning. This could turn many off muesli forevermore, but it did the reverse for me: give me a lumpy-bumpy bowl of yogurt, oats, seeds, and fruit any morning and I am a happy camper. Here I’ve created a portable version of my favorite mélange. 1. 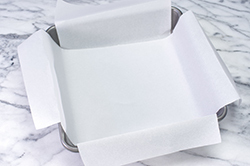 Line an 8-inch square baking pan with foil or parchment paper and spray with nonstick cooking spray. 3. 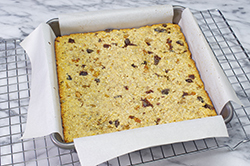 Spread the oats, nuts, seeds, and coconut on a large rimmed baking sheet. Bake in the preheated oven for 6 to 8 minutes, shaking halfway through until golden and fragrant. Transfer to a large bowl and let cool; stir in the protein powder. 4. 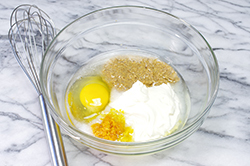 Mix together the egg, yogurt, nut or seed butter, honey, oil, and lemon zest until blended. 5. Add the yogurt mixture to the oats mixture and stir until just blended. Mix in the dried fruit. 6. Spread the batter evenly in the prepared pan. 7. Bake in the preheated oven for 13 to 16 minutes or until top is golden brown and a toothpick inserted in the center comes out clean. Transfer to a wire rack and cool completely. 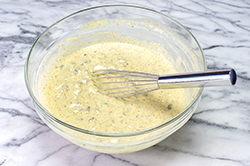 Spread or drizzle the mixture with the bar coating, if using; refrigerate for 30 minutes. 8. 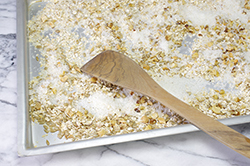 Using the liner, lift the mixture from the pan and transfer to a cutting board. Cut into 12 bars. MELT 1/4 cup natural white chocolate chips in a microwave or double boiler according to the package directions. WHISK in 1 tablespoon virgin coconut oil until blended, then whisk in 1 tablespoon plain, nonfat Greek yogurt, 1 teaspoon at a time, until blended and smooth. MAKES enough to coat one 8- to 9-inch pan of bars (double the recipe for a 9 by 13-inch pan). 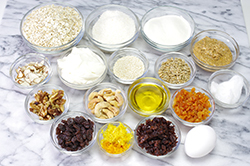 -	If you don’t want to use protein powder, simply increase the total amount of oats by 1/3 cup. 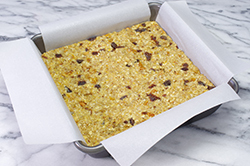 Alternatively, add 1/4 cup of flaxseed meal or 1/2 cup of nonfat instant milk powder. -	Be sure to use Greek yogurt for the recipe. It is a strained yogurt, which means it has a much lower water content than regular yogurt. -	If you’d like to use regular dairy or nondairy yogurt, strain 2 cups of it through cheesecloth or coffee filter overnight. Discard the excess liquid and use 2/3 cup of the strained yogurt. 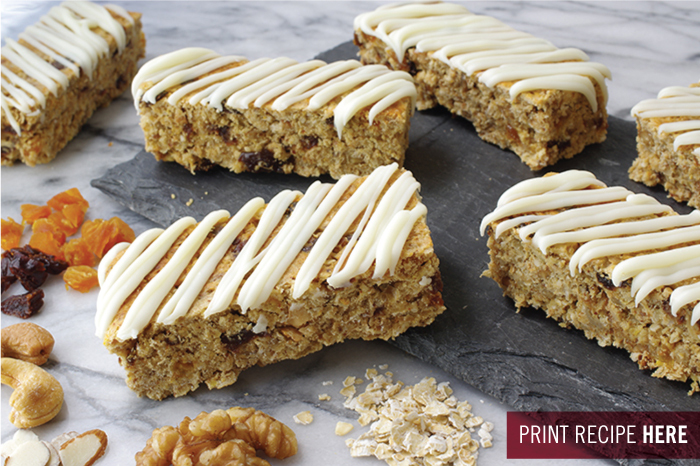 QUINOA, KAMUT, OR SPELT MUESLI BARS – Replace the oats with an equal amount of quinoa, kamut, or spelt flakes. 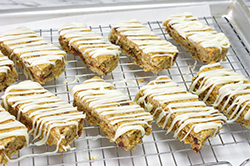 VEGAN YOGURT MUESLI BARS – Use strained nondairy yogurt in place of the Greek yogurt, agave nectar in place of the honey, and vegan protein powder in place of whey. 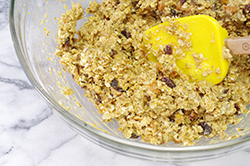 Use 1 tablespoon flaxseed meal, mixed with 3 tablespoons warm water, in place of the egg.